Implementation of Adapted Energy Management Standard: an adapted Energy Management System for the printing industry will be implemented in 100 SMEs with the help of consultants/Energy Managers to enhance the awareness of industrial associations and SMEs in the European Printing Industry by introducing different materials, awareness tools, benchmark tools for assessment, and a EMS Standard manual for the Printing Industry in EU. To give an insight into the feasibility of using the ClimateCalc Basic calculation tool a climate account for a fictitious company has been established. The tool can be tested in a demo version without user access. In the demo version it is not possible to change data and calculations or to print data and reports. In the project 100 SME’s with a fulfilled energy management system according to EN 16001 and/or ISO 50001 and potentials on energy efficiency improvement will participate. Per partner country a minimum of 20 SMEs will participate. 25% of the companies will implement a Basic EMS and 75% of the SMEs a Full version of the EMS. Click on the name of the country to get access to the list of companies. 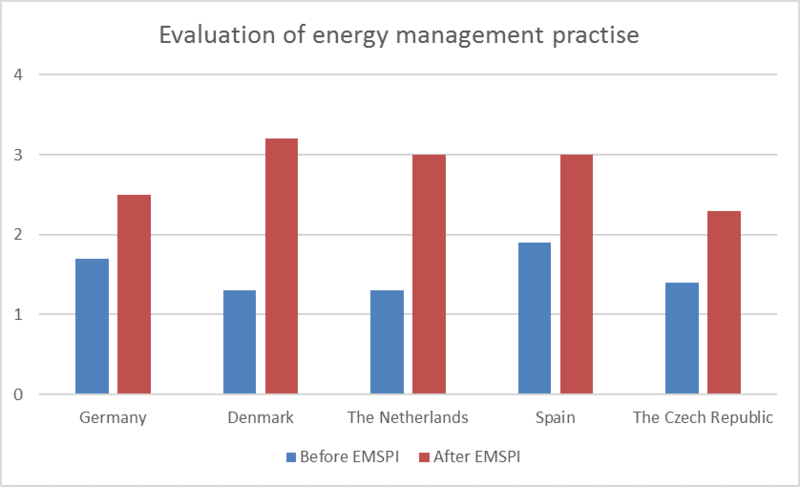 The work within the EMSPI project has led to the successful implementation of energy management systems in 100 printing companies in five countries (Denmark, Germany, Netherlands, Czech Republic and Spain). Energy cost savings of 2 140 000 € (a 12% reduction of costs). The printing industry in all five countries was evaluated at the beginning of the project as part of the energy diagnosis document. By the end of the EMSPI project a similar rating was performed based on the 100 printing companies participating in the project. 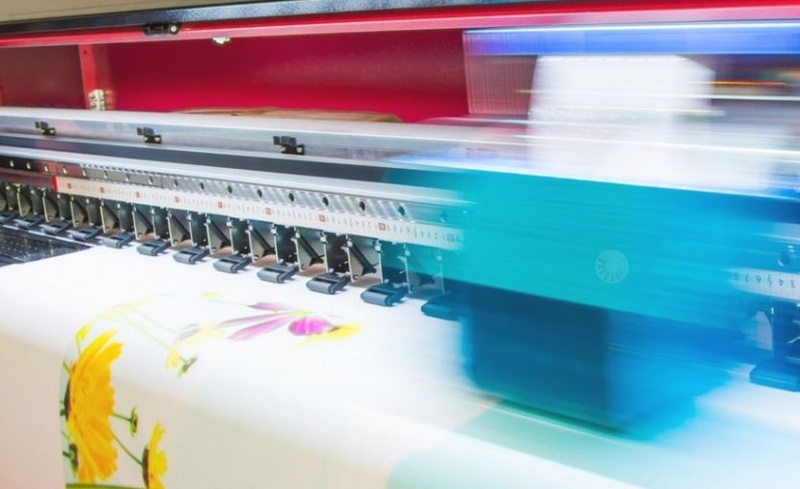 The rating was performed by assessing the performance of printing companies in eight categories on a scale from 1 to 4, where 4 represents best practise. The diagram below shows the situation, before and after the EMSPI project. The average score for all companies increased from 1, 5 before the project to 2,8 after the project. The overall conclusion of the rating is that the companies participating in the EMSPI project do perform well in relation to the parameters where they have simple procedures or tools to support them in the work with EnMS. The EnMS system manuals that were developed through EMSPI contributed to this high score. When it comes to parameters that require an internal prioritization or adaption to the company specific conditions there is in general potentials for improvements. This is particularly true in relation to working with goals and action plans focusing on the daily production but also in relation to maintenance, monitoring and supplier management. In all the participating companies an energy review was carried out with the aim of identifying the potential for energy savings. 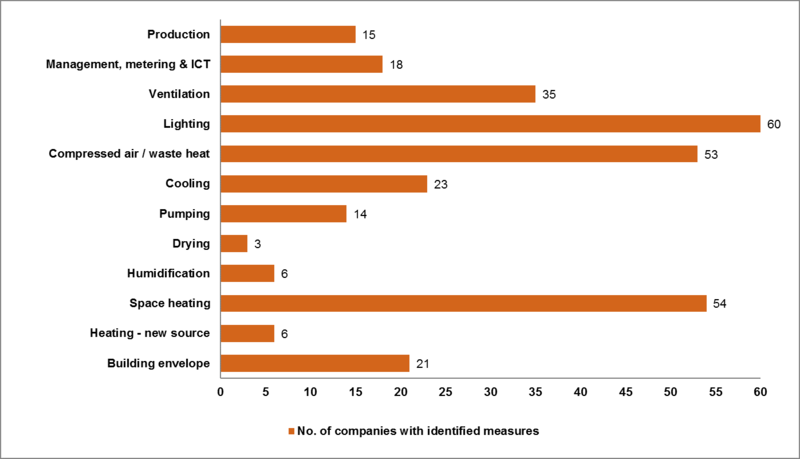 The figure below shows typical energy saving measures and to what frequency with which typical energy saving measures were identified among the 100 companies involved. Typical energy saving measures proposed throughout all five countries were in relation to lighting, space heating, compressed air and ventilation. Lighting measures were most often identified by energy experts from the partner organisations. 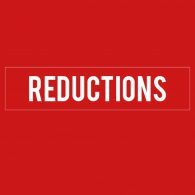 Savings in lighting is extremely relevant for printing companies due to the technological development in this area during the last few years. Most companies have older light installations which they can often only control by switching the light on and off manually. New light installations use approximately 40 - 60% less electric energy compare to the old installations, depending on operation time. Furthermore, lighting control in relation to daylight or activity can reduce the energy consumption even more. Compressed air is the most demanding technology in terms of electric energy consumption. Used compressors are often old, inefficient, have a high specific demand and the waste heat from compressors is not used. Most existing compressors can be adapted to or be supplemented with standard heat recovery equipment. New compressed air systems represent an excellent source for heat recovery and could improve overall system efficiency. Waste heat can be used for direct space heating or hot water heating. Currently only few companies have utilised all these possibilities. Ventilation: Some companies have an old ventilation system installed which is not using heat recovery and the fan motors are not equipped with inverters (frequency control). Moreover, the old ventilation systems have limited options for regulation. Sometimes the system was designed for previously installed technology what has a different needs for ventilation (e.g. due to higher use of chemicals in production in the past). The current ventilation requirements are lower which means the system is oversized. Space heating: Many of the heating systems are old, inefficient, thermostatic valves are not installed on radiators and sources of heat (boilers) are close to the end of the lifetime. An efficient system renovation is needed in a number of companies, both for offices and for the production plant. To conclude, not all companies were convinced in the beginning that any energy efficiency potential could be identified or that there would be a need for the implementation of energy management. However, after gathering relevant energy data, a walk through the companies by energy experts, some measures could always be identified. So after this first visit, companies became far more open to energy management and its implementation. From the evaluation of the implementation process, it appears most of the companies were satisfied with the EMSPI-developed material. It appears a large amount of participants is satisfied or very satisfied with the support throughout the implementation project. The participating companies also stated clearly they actually expect to achieve energy reduction and will recommend the EMSPI material to fellow companies. We can therefore conclude that the EMSPI project is on its way to be successful. That success has been achieved by the good contribution of the participating companies. More information about the final results of the project can be found at: www.emspi.eu. Energy management is nowadays a subject that is inseparable linked to every company. Through an Energy Management System, companies are helped to meet the objective (or legal regulations) to comply with energy efficiency and savings with the aim of actively reduction of greenhouse gas. In the print media industrie more and more companies show serious interest for this subject. From the EMSPI-project there are a total of 110 notifications to participate in the implementation of ISO 50001. Companies had in some participating one and in other countries more workshops for the implementation of the Energy Management System according to the ISO 50001:2011. Energy management is nowadays a subject that is inseparable linked to every company. Through an Energy Management System, companies are helped to meet the objective (of legal) to comply with energy efficiency and savings with the aim of actively reduction of greenhouse gas. In the print media Industrie more and more companies show serious interest here for. 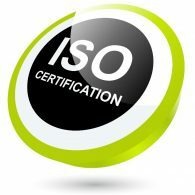 From the EMSPI-project there are a total of 30 notifications to participate in the implementation of ISO 50001. Companies had at least four workshops for the implementation of the Energy Management System according to the ISO 50001:2011. In addition to the workshops, there were visits on locations, in order to note to what level energy management within the business is actually carried out. It was striking how many companies still were surprised with the amount of work required for the realisation of the objectives for EMSPI-project. That was not all to the adaption work of the developed blueprint material to their own business operations, but a major task was to gather the right energy data. Collecting energy data turned out to be the real challenge. Especially for smaller companies, which until recently, did nothing with energy monitoring. For the big companies it seemed something simpler since they keep track of energy data from the legal framework. A final meeting with participating companies was organized. 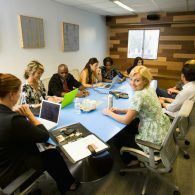 At the meeting, the interim results, based of all data collected, were presented. On the positive side, the target for energy savings achieved are good. As regards the potential CO2 reduction the result so far to call itself particularly well: the goal was 880 tons of CO2 reduction per year and it seems to be heading for more than 3,000 tons. The companies found this a good result and eventually see in practice how the effort over the last few months results in a success. 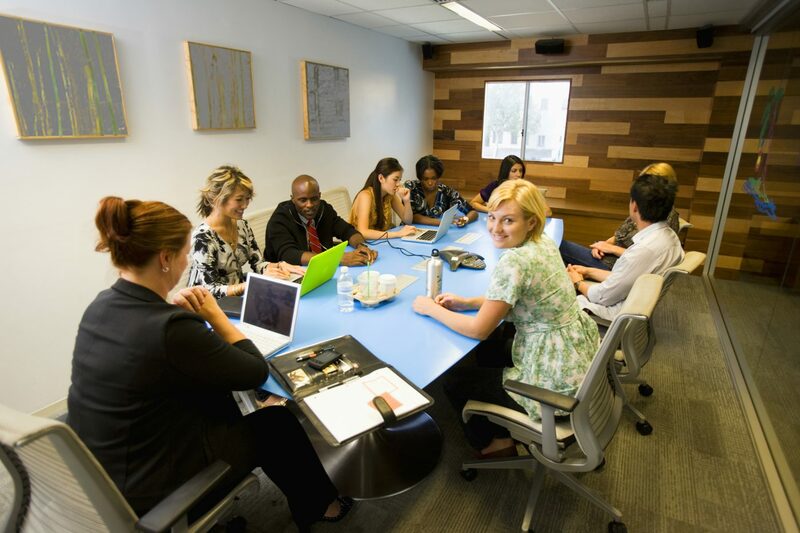 In addition presenting the results, in the meeting experiences were exchanged. The energy managers of the participating companies indicated they would like more information about the payback periods of investments (ROI). To teach the goals technical improvements can be necessary. The financial part of it is also very important. On the other side companies indicated that if many energy saving measures were implemented, it was no longer certain that some more savings could be achieved. Taking part in the EMSPI project made sure for internal increase in energy awareness among colleagues and the topic ‘Energy’ is back on the boardroom making it again as a serious management issue. From the evaluation of the implementation process, it appears most of the companies were satisfied with the EMSPI-developed material. It appears a large amount of participants are satisfied or very satisfied with the support throughout the implementation project. The participating companies also give clearly they actually expect to achieve energy reduction and will – by the pragmatic approach – recommend the EMSPI material to fellow companies. We can therefore conclude that the EMSPI project is on its way to be successful. That success has been achieved by the good contribution of the participating companies. Printing companies were especially interested in concrete energy efficiency measures that they could undertake in order to save energy and money. The team proposed specific measures for each printing company individually and these will be proposed in the action plan that will be part of the energy management system. Replacement of the existing fluorescent lamps in the production area for LED fluorescent lighting was proposed in one company. This area is currently illuminated with 48 pieces of double tubular fluorescent lamps with an output of 58 W / tube. And the lights are on for 4,000 hours per year. The project team made a calculation based on a replacement piece by piece (before carrying out they investment a light-technical calculation needs to be made where the total number of tubes could be larger or smaller). The electricity savings are calculated at 10 MWh/year. At an energy price of 2115 CZK/MWh the annual cost savings will be 22,000 CZK/year. The investment is estimated at 100 000 CZK, meaning an approximate return on investments of 4.7 years. 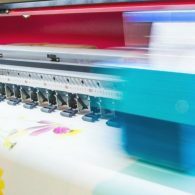 At another printing company, replacing the fluorescent lamps in the area of the printing machines was also considered. The existing lamps had slightly different but comparable parameters, leading to an estimated return on investment of 4.3 years. In a smaller printing company, where they considered the same measure, the rerun on investment was more than 6 years. The longer pay-back period here was caused by the lower number of lighting hours per year, leading to less energy savings. 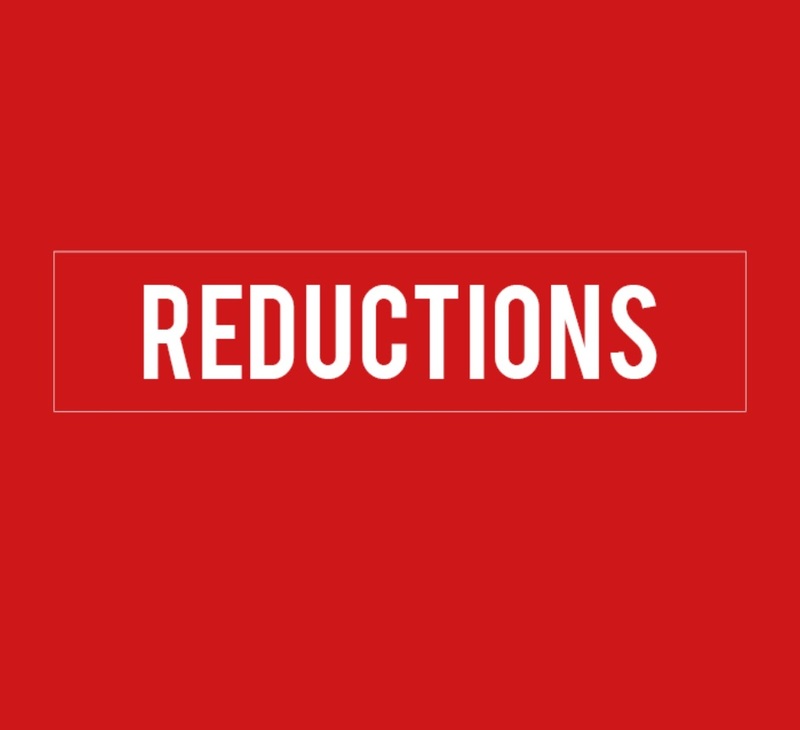 These examples show that such a standard measure may have different savings and pay back times depending on the specifics of the company, such as the no. of hours that the lights are on during the year. Utilization of waste heat was proposed for heating the administrative part of one mid-size printing company. Installing fans that will blow warm air from the plant floor to the space administration, suppresses the dependence of heating the administrative section for heating the production hall. The reason for the regulation of heat supply gas boiler depending on the internal temperature of the production hall, which is located central thermostat. The measure leads to a small increase in electricity consumption, which is compensated with a large decrease in gas consumption. The return on investment of the measure at current electricity and gas prices is only 2.3 years. Another proposed measure, leading to the use of waste heat from the compressor for hot air heating in the commercial department. This is a project with similar results, but due to the higher upfront investments, the return on investments is almost 6 years. Also here we see different numbers per company. The project Energy Management Standardization in Printing Industry (EMSPI) was by the end of 2015 changed into the phase of implementation in the Danish printing companies. Workshops have been carried out focusing first on an introduction to energy management and followed by training of the printing companies in working with energy management and improving the energy performance. In total 20 Danish companies are participating in the EMSPI project and have started the continual process of working with energy efficiency at the strategic level as well as the operational level of the company. The participating companies have shown great enthusiasm working with the developed tools and guidelines. In all participating companies the energy consumption as well as the potentials for energy savings have been mapped and analysed and the companies have started the process of setting specific targets and making action plans. In some companies the first energy improvement project have already been carried out while in other companies the projects are planned to be carried out during 2016 and 2017. Energy efficiency has been acquiring a more important role in Spain throughout the years. This is mainly due to the current national situation of political and economic instability. This situation that affects directly to the energy sector, makes energy efficiency one of the most safer values when designing saving measures by the Spanish Companies. A number of 21 Companies, with the assistance from the specialized international firm Factor, have developed an analysis of their sources and energy consumption, which allows them to design a series of energy measures to reduce their energy consumption. In order to standardize and to continue with the energy plan, they are concluding with the implementation of an Energy Management System based on the ISO 50001 standard adapted to the Industry. The Spanish companies have reduced the main KPI of the project (GJ total energy / ton paper) from 1,3 to 1,1. As a consequence, they have reduced considerably their CO2e emissions in paper consumption, electricity and waste treatment since 2013 (893 tCO2e), incorporating measures in lighting, insulation and efficient machines, among others. However, the companies are in the process of developing a new package of measures in order to reduce their consumption over the next few years. The EMSPI project shows significant energy reductions in the printing industry, and there are more to come! The project Energy Management Standardization in Printing Industry (EMSPI) has been going on since the beginning of 2014 and we are now seeing the first physical results of the work which have taken place in the participating printing companies all over Europe. In total the energy consumption has been reduced significant with more than 30.000 GJ from 2013 to 2015 which is 75% of the overall target of the EMSPI project. But the partners of the EMSPI project expect to see even further reductions when the EMSPI project is finally evaluated due to intensive consultancy and activity in the participating companies during 2016. From the EMSPI-project there are a total of 110 notifications to participate in the implementation of ISO 50001. Companies had at least four workshops for the implementation of the Energy Management System according to the ISO 50001:2011. In addition to the workshops, there were visits on locations, in order to note to what level energy management within the business is actually carried out. It was striking how many companies still were surprised with the amount of work required for the realisation of the objectives for EMSPI-project. That was not all to the translation work of the written blueprint material to their own business operations, but many more to find the right energy data. Collecting energy data turned out to be the real challenge. Especially for smaller companies, which until recently, did nothing with energy monitoring. For the big companies it seemed something simpler since they keep track of energy data from the legal framework. A final meeting with participating companies was organized. At the meeting, we have presented the interim results based of all data collected. On the positive side, the target for energy savings achieved are pretty good. As regards the potential CO2 reduction the result so far to call itself particularly well: the goal was 880 tons of CO2 reduction per year and it seems to be heading for more than 3,000 tons. The companies found this a good result and eventually see in practice how the effort over the last few months results in a success. In addition presenting the results, we exchanged experiences. Companies indicate that it sometimes turned out by financial circumstances technical energy measures to be possible to implement. Companies indicate also they would like more insight into the payback periods (ROI). On the other side companies indicated that by many energy saving measures were implemented, that it was no longer certain that some more savings can be achieved. Taking part in the EMSPI project made sure for internal increase in energy awareness among colleagues and the topic ‘Energy’ is back on the boardroom making it again as a serious management issues. We can therefore conclude that the EMSPI project is on its way to be successful. That success has been achieved by the good bet of the participating companies. They now have a strategic lead built up with regard to their colleagues, what benefits them once (in 2017) the enforcement in energy management from the Government will greatly increase. As is often said: ‘A good committed start is half the battle’.